Launched in 2017, EnviroStars is a free, one-stop green business program for the state of Washington. More than 20 Washington cities, counties, municipalities and utilities developed the EnviroStars programs, which provides assistance and recognition to Washington businesses for saving energy and water, reducing waste and pollution, choosing safer products and more. 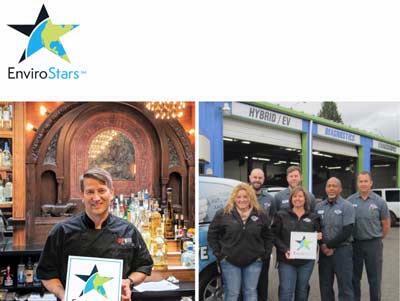 In its first year, EnviroStars recognized 215 businesses in the state of Washington. Snohomish County had 16 businesses recognized for sustainable practices, including Mukilteo Natural Health Clinic, Walnut Street Coffee and Everett’s Midas Auto Service Experts. For a list of recognized businesses, visit envirostars.greenbiztracker.org.